That conversation among largely anonymous anti-immigration extremists exists in the broader context of a right-leaning talk radio culture in Quebec that has been critical of Muslim immigration and what it sees as a failure by Muslims to assimilate into Canadian culture. Talk radio of this stripe is rare elsewhere in Canada and is reminiscent, albeit far more mild, of the raucous right-wing shows in the United States. The radio stations Radio X and FM93 are among those cited as giving voice to anti-Muslim activists. While their own commentary may be muted, they give a platform to less-tolerant voices from sites like Point de Bascule, which means Tipping Point, and Poste de Veille, which translates roughly as “Watchtower” and whose website shows a pirate ship with a jihadist flag as its sail approaching Quebec City. 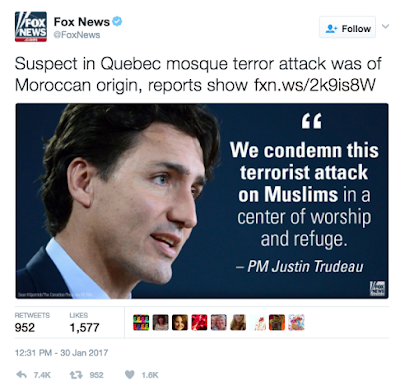 One popular conspiracy theory links Prime Minister Justin Trudeau to the Muslim Brotherhood, a pan-Arab group that supports the application of Islamic law in Muslim communities. Of course stupid people, the kind of people most taken in by insane conspiracy theories and irrational hatred of the Other exist in every society and even Canada has not been spared. Stupid people will always be a problem in any human society. It should be noted that the far-right, in its endless quest to demonize all Muslims immediately in the wake of the shooting tried to claim the shooter was Muslim himself. The Trudeau government had to force Fox News to take down one of its lies.